Clachnaben Walk, Deeside, Cairn O' Mount, Clachnaben, Hill of Edendocher and Mount Shade. 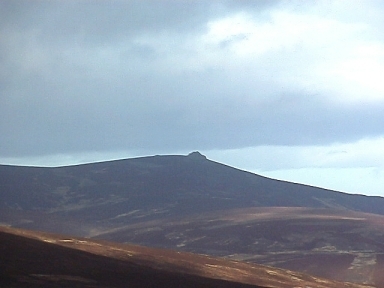 The prominent tooth-like rock which proudly graces the summit of Clachnaben makes this hill an instantly recognisable feature of lower Deeside. Seen from the south as you approach over the Cairn O' Mount, this 30 metre high lump of granite marks out Clachnaben from its similar sized neighbours on each side, Hill of Edendocher and Mount Shade. With Bennachie further north, which also boasts a rocky granite crown known as the Mither Tap, the pair have given rise to the couplet: Clachnaben and Bennachie, Are twa landmarks frae the sea. Parking for Clachnaben is provided just off the B974 a few hundred metres north of Glendye Lodge. A signposted pathway leads from the car park into an enchanting wood of some old and some more recently planted evergreens. Bird life is abundant here and in summer this part of the walk will have its own accompanying soundtrack from high up in the branches. When we visited in February a number of buzzards were patrolling high above the trees. The path undulates through the woods and is likely be quite muddy after rain. After a few minutes you emerge into open farmland protected by a fence. As Clachnaben is such a popular hill we decided to shun the common honeypot route up Miller's Bog in favour of tackling the wooded Greystane Hill. This has the advantage of adding a few extra kilometres to the day and also gives rewarding views southwards to the Howe of the Mearns. To go by Greystane Hill, turn to the north as you emerge from the woods and follow the Land Rover track keeping the fence to your left hand side. This track winds its way though a new conifer plantation, reaches the top of 337 metre high Greystane Hill, before turning in a south westerly direction along the foot of Threestane Hill and Mount Shade. This track eventually peters out at a height of around 300 metres at grid ref 633866. From here, climb to the electrified deer fence which is visible up ahead and, keeping it on your right hand side, follow it south west until your reach a large stile allowing you to cross it in safety. Another ageing wood appears on your left as you begin climbing into the valley between Clachnaben and Mount Shade. If you are lucky you may spot red squirrels darting about on the higher branches. After leaving the wood the path drops steeply before rising gently again to a spot where a signpost points out the route to the summit. The Clachnaben Path Trust has done much work in repairing the way here and it goes without saying that hikers should stick to the indicated route to avoid any further erosion of the hillside. The going becomes a bit harder as the upper reaches of Clachnaben hove into view. On a good day you will be treated to a fine view of the summit's unmistakeable spire which draws the walker on. The eastern face of this tor is of steep, rough granite which give climbers a few chimney routes as well as some miniature ridges and face climbs. It can be easily climbed from the sides although the granite will be slippery when wet. Standing on top of this remarkable feature gives a grandstand view of the surrounding district. To descend, simply follow the same marked path down to the woods but, instead of crossing the deer fence, keep to the path with the trees on your right and you will soon pass through a gate where you join a Land Rover track taking you through Miller's Bog. The stream needs to be crossed on three occasions here. It can easily be forded in summer but the estate have kindly provided little wooden bridges at strategic points to prevent wet feet. Follow the track all the way down to an old stone bridge where Miller's Burn cascades in a little waterfall through a tiny gorge in a copse of trees. From here the path goes uphill past the buildings at Glendye Lodge before entering the wood at the start of the walk and eventually back to the car park. Map OS Landranger 1:50,000 sheet 45. Start/parking Car park off the B974 at grid ref NO 649867. Grading A relatively easy hike towards an unmistakeable destination. A fine summer walk but this area does get its fair share of wind and rain so make sure you have packed your waterproofs.